"He saw and he believed"
Bishop Donal, Bishop Seamus, Bishop Francis, Father John (Fr. George's nephew), my brother priests, the extended members of Fr. George's family including his sister Ann in Wexford, members of this parish and visitors from the parishes where Fr.George has served in this Diocese – welcome. What a day to die! What a day to die! Death is not the most natural link to think of on Christmas morning, and when I received Fr. John's message on Christmas morning, early that Fr. George had gone to his eternal rest, I was surprised, but as I thought about it as the day progressed, I began to feel that this is surely a very unique day to go on such a journey and it's maybe not so surprising after having already spent 87 Christmases in this world, Christmas Day was surely a very good day to be 'born again' and this time born into eternal life. In fact it's probably a beautiful date for a Christian to die, as it's a date that touches on new beginnings; a new beginning that we all hope to share one day. And today, the feast day of the evangelist and apostle John, is a beautiful day to celebrate a priest's Requiem. John the Apostle was involved in many of the central events of Jesus' life: the Transfiguration, the Crucifixion, and the discovery of the Resurrection (today's Gospel). He is described as the "disciple whom Jesus loved" and the one to who He confided the care of his mother Mary after his death. He may have been the youngest of the 12 apostles, but he lived to a great age, and died not in a violent way as many of the other apostles did. He is mentioned in the Acts of the Apostles, later he was exiled to the island of Patmos and is said to have died at Ephesus. He wrote a Gospel, contributed to three epistles and the Book of the Apocalypse. Today in the church universal we journey of the apostle John on his feast-day and during this Christmas season we celebrate the story of the one in whom John believed, the one in whom we all believe and whose birthday we celebrated two days ago. And this morning, at this Requiem Mass, despite the sadness in our hearts that we will experience, knowing that Fr. George is no longer physically present with us who enjoyed his company, we celebrate the story of his life. Naturally it's impossible to condense 87 and a half years into a few minutes, but you bring your own personal memories of Fr. George to your prayer today. Fr. George's story began not too many miles from here in Carndonagh where George was the youngest of a family of 14 siblings, three of whom died in infancy as you his family know. We express our prayerful solidarity with his surviving sister Ann and his many nephews and nieces who have gathered here this afternoon. George was gifted athletically. As a young man he was a talented soccer player, playing centre-forward for Carn Rangers and he maintained an interest in soccer and many sports. I remember that Monday afternoons were sacred for a four ball at Baronscourt, Newtownstewart, with Fr Paddy John McGuigan and Fr. Dan McNicholl, but for the life of me, I can't remember who the fourth member was! Fr. George told me that Monday's were their day, on that course where they prepared their homilies for the following Sunday! George was gifted musically with a beautiful singing voice. He loved the local drama scene and the Wexford Opera festival was a highlight on his annual calendar. He was gifted with a unique cadence and tone to his voice, that made his speaking or singing in public very distinctive. I'm sure that it was in that large family environment that George discovered the values and developed the gifts of character that nurtured every aspect of his life thereafter. I am sure his family influence gave him direction when he came to answering the Lord's call to priesthood. He had two uncles priests in this diocese and his older brother Eunan had entered the Passionist Order and served his ministry in Africa. George brought all of his gifts and talents to Maynooth where he began his academic studies in 1947. There were 64 men from all four provinces of Ireland ordained on 20th June 1954 by Archbishop McQuaid of Dublin. In a few notes shared with one of his nieces a while ago, he wrote about this part of his story in these words "we were dispatched from there to our respective diocese to seek appointment from our bishops"
Through a journey of 60 years of ministry in this diocese Fr. George served in the parishes of Greencastle (Co.Tyrone), where his uncle Fr. George Nelson had been he em first parish priest of that new parish in 1892; Glenullin in Co. Derry in the parish of Errigal where his parish priest was Fr. Lagan, uncle of Bishop Lagan here today; Lavey in south Derry, Dungiven in North Derry, Drung, Co.Donegal, Cappagh/Killyclogher C.Tyrone, Dunamanagh, where served 21 years as parish priest until the 'magic age of 75' (that was how he described it in his notes) and finally he was very happy to return here to this parish where Bishop Hegarty invited him to minister in Desertegney. The physical journey of a priest through different locations and the achievements of that journey (outstanding among those, although I might be prejudiced was Fr. George's contribution with Fr.Hugh Conway, the parish priest, to the refurbishing of Saint Patrick's Church, Dungiven in the post Vatican II era of liturgical reform) although important are secondary to the real ministry of a priest....a ministry of relationship; relationship with God, the God born among us at Christmas and relationships with people. And I am confident that there are many people present in today's congregation who can witness to the unique ministry Fr. George exercised in all the parishes where he served and what grace they and their families received through him. Today I am very conscious of the turbulent and demanding ministry demanded of Fr. George and of every priest and bishop who served in this diocese during that all consuming period now called 'the Troubles' that dominated so much of their ministry. It was a time when a special form of leadership was called for. Fr. George and his colleagues answered that call, trusting in the loving God in whom they believed. After my ordination to priesthood my first assignment was to the parish of Drumragh - also in Omagh but on the other side of the river Strule from Cappagh where Fr. George was ministering at that time - I was glad that I could look upon him as a colleague at that time, someone to mentor me in the early days of my priesthood and someone to whom I had no other direct responsibilities. In later years he shared that he found his nine years there demanding but very fulfilling as a priest. There were five churches, three hospitals and four schools within the parish boundaries, so there was a lot of variety to ministry there. Many people have received much through his ministry throughout the years. There have been moments of grace maybe some moments of failure too, no doubt, but today we thank God for this good priest and his largely unsung life of faithful ministry. Whenever I came into Fr. George's presence, I always felt in the presence of a person of prayer. He wasn't one who just said his prayers to fulfil an obligation but he came across as someone who prayed his prayers, prayed his daily Mass putting so much effort into his praying. Fr. George was for many the priest who was the listener, the counsellor, the healer and he gave of his talents and his time generously. Those who benefitted from these aspects of his ministry will appreciate what I am saying without further explanation. He trained as a counsellor with CMAC and just a few years ago, his role in setting up the Samaritans in Omagh was publicly acknowledged. He was justifiably proud of the support that particular organisation has given so many people throughout the years. Fr. George's commitment to community building was a testament to his understanding of ministry, and the Gospel imperative to go out to all peoples. He was on the committee that set up the first Credit Union in Dungiven in 1967. He was involved in the work of PACE (Protestant and Catholic Encounter) in the Omagh of the 1970s and early 80s. He believed that the pastime of bowls could bring people together. 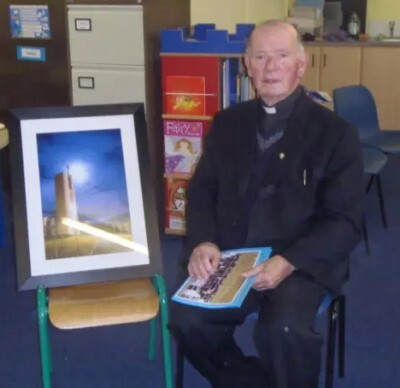 To develop community within the local parish he promoted the idea of parish magazines and along with hard working committees he developed these ideas in Dungiven and Cappagh. These make interesting reading now from the historical perspective. An aside about the first Benbradagh in 1970, Fr. George, being a dreamer, wrote about how he anticipated the Dungiven by-pass that the envisaged being completed by 1980......that project still hasn't happened! Retirement wasn't a state Fr. George aspired to, so he was very pleased when Bishop Hegarty invited him to serve you, the people of this parish at Desertegney, he loved being here and the beautiful scenery that surrounded him, looking out on the Swilly. But most of all you allowed him to indulge in one of his favourite pastimes, an area where he was not short on talent, his garden! I believe that he spent so much time, planning and planting, then re-planning and replanting that some of his friends used to refer to him as George 'Bush'! It's a coincidence that another singing 'George' died on Christmas Day 2016! I suppose I disappointed Fr. George (and others) when my timidity and shyness prevented me from becoming an altar server at that time, but the manner in which he celebrated Mass touched something deep inside me, so much so that I believe God used him to invite me to consider priesthood as a life-choice for me! In the years since then, childlike admiration and respect for an important adult grew to mature companionship and genuine fraternity - a mentoring that was never formal but always implicit in everyone of our encounters. A gift I will value for the rest of my life. One more story. At the end of my first year in Maynooth I participated in the Camp America program where university/third level students became counsellors at children's camps in the USA. One of my fellow counsellors has an LP which he said I might be interested in. It was John Lennon's protest LP entitled 'Sunday Bloody Sunday' and it was banned here on this side of the Atlantic at that time. It was John Lennon's response to the events of January 1972 in Derry. The lyrics were printed on the cover and there too was a photograph, the subject was a protest march in Dungiven where 13 people carrying white crosses walked to the police barracks and placed them there. And leading the march was Fr. George Doherty. Imagine a priest of Derry diocese was chosen to grace a John Lennon protest LP! Imagine, it was Fr. George, unique surely! Christmas Day, what a day to die, but Fr. George, why not, you have given your all. Thank you. Now rest in peace.